In my ongoing weight loss quest I have scoured books, magazines and websites for recipes that are healthy and the family will eat without that wilting look of disappointment on their faces. Here is one I ran across from the fine folks at Taste of Home, I have adjusted it slightly but nothing that would upset the nutritional facts substantially. The recipe calls for an 11×7 pan but a 13×9 works fine, just know the topping will not go to the edges. Coming in at 340 calories per serving, you can afford to add toppings likes shredded cheese, chopped scallions and greek yogurt (or reduced fat sour cream) for an extra flourish just remember to be cool and don’t overdo it. Preheat oven to 425. Coat 11 x 7 pan with cooking spray. In large skillet, cook beef until just pink and drain off any extra fat, add onions and peppers and cook a few minutes until softened and beef is no longer pink. Add beans, tomatoes, chili powder, Worcestershire and cumin and simmer uncovered for about 5 mins. While chili is simmering, mix together all the other ingredients (flour, cornmeal, sugar, salt, egg, milk and oil) until just moist. Transfer chili to 11×7 pan and spread to level. Spoon cornmeal mixture over chili and gently level (do not spread too thin). Bake (uncovered) for 15-18 minutes or until filling is set and toothpick comes out clean. Let stand for 5 minutes before serving. Nutrition Facts: I serving= 340 calories, 10g fat (3 saturated), 38g carbohydrates, 6 g fiber, 22 g protein. 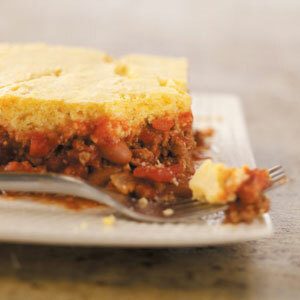 Nothing goes better than chilli and cornbread. All that you need now is a great beer to go with it. If you are looking for a great beer to go with this then follow my blog for great beer recommendations.